﻿ Fun Easy English - Travel the United States of America - Maryland. Learn before you travel. This section of Fun Easy English focuses on facts and other cool stuff about your favorite U.S. state. This is great English reading practice. This page focuses on the state of Maryland. 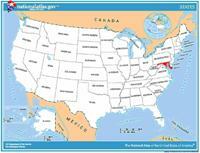 One of the original 13 states to join the Union (in 1788), Maryland is in the middle of the Eastern Seaboard. It's believed that Lord Baltimore, who received a charter for the land in 1632, named the state after Queen Henrietta Maria, wife of King Charles I. The Mason and Dixon line was drawn in the 1760s to settle a dispute between the Penn and Calvert families. In addition to marking the boundary between Pennsylvania and Maryland, it is the traditional boundary between the North and the South. 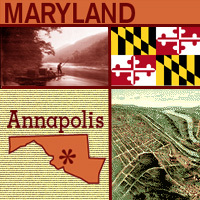 Maryland is known as the "Free State"; its flower is the black-eyed susan; and its capital is Annapolis, home of the U.S. Naval Academy. The state flag of Maryland was officially adopted in 1904. The Maryland flag bears the arms of the Calvert and Crossland families (also seen on Maryland's state seal). Calvert was the family name of the Lords Baltimore who founded Maryland, and their colors of gold and black appear in the first and fourth quarters of the flag (and on several of Maryland's state symbols; the state flower, state bird, state insect, and even the state cat). Origin of Name Named to honor Henrietta Maria, wife of England's King Charles I. Travel and tourism site for Maryland - This state travel and territorial tourism site provides ideas for your vacations, meetings, and more. Have you ever heard of oyster-shucking? To shuck an oyster you open its shell and detach the oyster inside. Every October, the St. Mary's Oyster Festival in Leonardtown, Maryland, celebrates the opening of the oyster season on the Chesapeake Bay. The festival also recognizes the life of the people who work the waters for a living. More than 150,000 oysters are eaten during the two-day festival. Shuckers use a special knife to do the job, and one of the events at the Festival is the National Oyster Shucking Championship Contest. People come from all over the country to see who can shuck two-dozen oysters the quickest and the best. Some past winners from this event have gone on to compete in the International Oyster Festival in Galway, Ireland. Many people like their oysters raw, but for those who prefer them cooked, there is a National Oyster Cook-Off. How much do you know about farm life? If your county or state has a fair, you can learn a lot about it there. A 1940s project to get young people involved in agriculture and homemaking skills turned into one of the largest county fairs on the East Coast -- and it was started by kids. The first Montgomery County Agricultural Fair began as a one-day livestock show in 1949, sponsored by the county's 4-H Club, an organization for young people interested in farming. The fair was a way for farmers to show their best farm animals to each other and to get youth excited about farming, gardening, and homemaking skills such as preserving foods. Over the years, the fair has become a way to get a peek into farm life, as fewer people are involved in farming. The Agricultural Center is a cluster of buildings built for the fair that are used all year long to host shows, exhibitions, and meetings. Today, the Montgomery County Agricultural Fair has grown into a weeklong event, involving more than 2,000 volunteers. Do you know who Benjamin Banneker was and what he did? Benjamin Banneker was a self-educated scientist at a time when most African Americans were slaves. Born a free black man in the British Colony of Maryland in 1731, he received some formal education, but he mostly borrowed books and taught himself science and mathematics. At 22, he borrowed a pocket watch, and without any training, figured out how to carve a working wooden clock that chimed each hour. Because of this clock, he became well known and people would visit him just to see his creation. Banneker ran his family farm for many years, but when he was in his late 50s, a neighbor's son lent him a telescope. He became interested in astronomy, the study of the planets and stars, and again taught himself a new science. He made calculations of tides, sunrises and sunsets, and even predicted an eclipse. For several years he published an almanac of these calculations. Today, he is best known for publishing six almanacs, called "Benjamin Banneker's Almanac," between 1792 and 1797. In the 1790s, Banneker also helped survey and lay out the land for Washington, D.C., which became the nation's capital. For a look at Banneker's amazing life, visit the Benjamin Banneker Historical Park & Museum in Ellicott, City, Maryland. Most people have heard of the Boston Tea Party, but did you know that Maryland had a similar "tea party?" In 1773, the British Parliament passed the Tea Act, which taxed tea and restricted who was allowed to import tea into the American Colonies. Bostonians protested by boarding three ships in the night disguised as Native Americans and dumping the British tea into Boston Harbor. This famous protest became known as the Boston Tea Party. The British responded by closing the Port of Boston until the Colonists paid for the destroyed tea. This angered many people in the other Colonies, and in Chestertown, Maryland, the citizens protested by deciding not to buy, sell, or drink British tea. Then, in May 1774, they boarded a British ship loaded with a cargo of tea and threw it into the Chester River. Unlike the Tea Party in Boston, the citizens of Chestertown made no attempt to disguise themselves and acted in broad daylight. Every May, the Chestertown Tea Party Festival is the site of a celebration remembering those brave citizens. There's a parade, a 10-mile run, Colonial crafts demonstrations, and of course, a re-enactment of the historic Chestertown Tea Party! Do you know what a "jimmy" is? Jimmies, callinectes sapidus, beautiful swimmers, channelers, sooks, and she-crabs -- are all names for the blue crab, a crustacean found in the Chesapeake Bay. The Chesapeake Bay is a large bay on the Atlantic coast of the United States. It has played an important role in the history and culture of the state of Maryland. Chesapeake Bay fishermen, or watermen, have harvested the waters for crabs, oysters, clams, and fish for many generations. They work in skipjacks, a name for workboats or fishing boats. Commercial fishing was a huge industry in Maryland, but pollution has caused a decrease in the population of the bay's marine life. Consequently, many watermen struggle to maintain their way of life. Nevertheless, Marylanders love their crab and eat them by the bushel at crab houses. These restaurants cover their tables with brown paper, unload a bushel of crabs on the table and provide knives and mallets for customers to pry the crabs open. Have you ever eaten a crab? Does your town play host to any ghosts? Every year the Public Library of Carroll County, Maryland, is a ghost host! Since the early 1980s, the library has held the Carroll County Ghost Walk. At this event, visitors come to the library and learn about local ghost legends and sightings. Afterward, they head out into the streets to tour the town of Westminster and see the spooky spots for themselves. Is Westminster really haunted? Some people think so. In fact, Cockey's Tavern in Westminster is said to have its own ghost -- a confederate soldier who was wounded in the Battle of Gettysburg. Stories say that he likes to help himself at the bar, rearrange pictures on the wall, and, in general, be a troublemaker. Over the years many strange and unexplained sightings have taken place in many other places in Carroll County. Come to the Carroll County Ghost Walk and see for yourself! You probably know someone who works in a city but doesn't live there. Today that's common. But before most people owned cars and most cities had bus systems, people needed to live as close to work as possible. That all changed in the late 1800s, when railroads were built from cities to outlying areas, allowing people to work in one place and live in another. People would work in the city and, at the end of the day, take the train to their homes in the suburbs, where it was quieter and less crowded. The suburbs also often offered cheaper housing. Takoma Park, Maryland, began in 1883 as a "railroad suburb" of Washington, D.C., our nation's capital. Nowadays, many people commute from their homes in the suburbs to their jobs in the cities in cars rather than trains, but lots of people still rely on public transportation. Today, thousands of Takoma Park residents commute to Washington using the subway, which is a kind of railroad. So, more than 100 years after its founding, Takoma Park is still considered a railroad suburb. The following is a description of national monuments in the state of Maryland. There are no national forests or parks in this state. If you plan to visit or live in Maryland for awhile then you should definitely plan to visit some of these fantastic places. 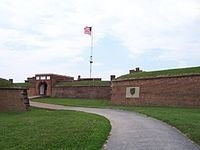 The only place designated a national monument and historic shrine, Fort McHenry is a star-shaped fort best known for its role in the War of 1812 when it successfully defended Baltimore Harbor from an attack by the British navy. It inspired Francis Scott Key to write "The Star-Spangled Banner". Harriet Tubman was a famed conductor on the Underground Railroad, leading dozens of slaves to freedom. This monument includes sites relating to Tubman's life, including the slave-built Stewart’s Canal and the home of Jacob Jackson. The areas within the national monument that are managed by the NPS have been additionally designated as a National Historical Park (NHP), and are managed by the NPS with reference to the authorities of the NHP legislation.